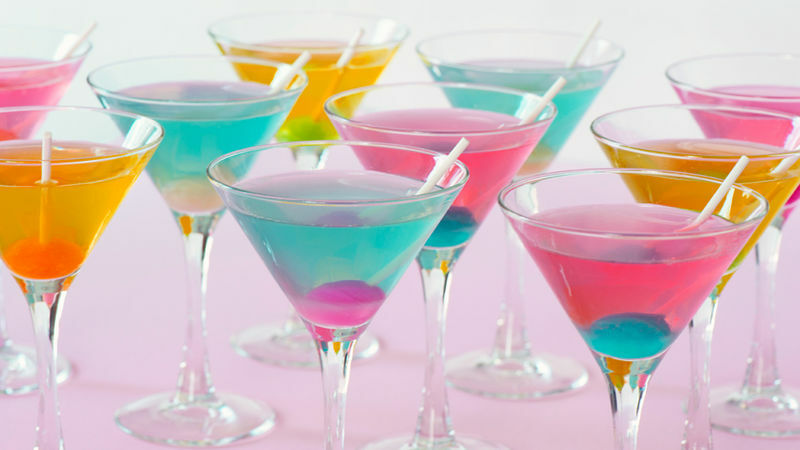 The Blow Pop Martini is the cocktail that perfectly highlights bubble-gum flavored vodka. It’s a perfect cocktail for spring break, or any kind of warm weather fete. You will definitely be serving these as a theme cocktail patio-side once the prairie thaws! This recipe is for a crowd (serves 12). Cut it down to a single cocktail by measuring the proportions of the lemonade concentrate, water, and vodka with your trusty shot glass or cocktail jigger, and adding a splash of the pucker liqueur. Careful with the pucker liqueur – the flavors are potent - too much and will overpower the bubble gum vodka! Continue the candy-inspired cocktail fun by garnishing each cocktail with a small lollipop immediately before serving. We know what you’re thinking: “Really? Bubble gum vodka?” It’s a bit of an offbeat booze to harbor such an enthusiasm for – but really, it's delicious. Bubble gum is one of those flavors, like candy corn or cotton candy, that takes you straight back to childhood. However, unlike candy corn or cotton candy, which now may taste tooth-splittingly sweet, anything bubble gum flavored still tastes amazing! So, as a grown-up, this vodka hits all the high notes – you can have your bubble gum and drink it too. Hope you are enjoying beautiful spring weather somewhere!